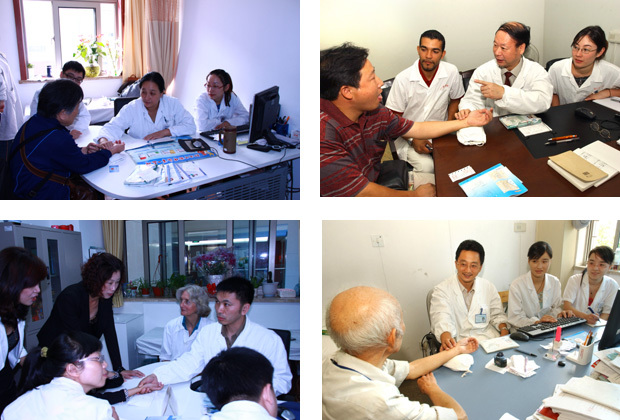 Combining the theory of traditional Chinese medicine with modern methods of Diagnosis and treatment, the department provides all kinds of medical services for diseases treatment & prevention, rehabilitation, and health regulation. It fully expresses the traditional Chinese medicine essence of holistic conception and treatment application by signs & symptoms differentiation. 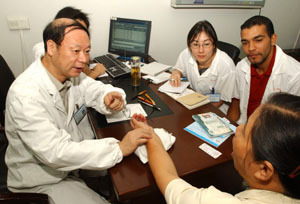 The department has several national level and provincial level prominent TCM physicians, they have accumulated abundant experience in preventing and treating respiratory diseases, elementary diseases and cardiovascular diseases, such as asthma, chronic Bronchitis, coronary heart disease, hyperlipemia, chronic atrophic gastritis, pyloric infection caused by helico-bacterium, cholecystitis, cholelithiasis, chronic diarrhea, irritable bowel syndrome, hepatitis and its related diseases. The department is also renowned for its TCM-based treatment of senile diseases. There is a research group specialized in the study of treating Senile Diseases by means of TCM which has made great progress in treating disorders such as chronic exhaustion syndrome, coronary heart disease, Sequelae of Strokes, senile osteoporosis and more. Dr Chen Yi, Chief Physician of Chinese Medicine, excellent instructor of academic experience inheritance task of national experts of Chinese medicine, deputy director and researcher of Zhejiang Institute of Prominent Chinese Medicine, committee member of Academic Board of Zhejiang Institute of Prominent Chinese Medicine, committee member of Academic Board of Zhejiang Provincial Hospital of TCM, member of standing committee of 10th People's Congress of Zhejiang Province. Researcher of Advisory Committee of People's Government of Zhejiang Province, Health Consultant Expert of CPC Center Government, the only TCM doctor in Zhejiang Province specifically invited by Health Board of CPC center government, consultant of Cadre's Health of Zhejiang Health Committee, member of Professional Board of National Febrile Diseases Committee, Chairman of Geriatric Profession Committee of Zhejiang, member of council of Zhejiang Chinese Medicine Academy, editorial board member of Zhejiang Journal of Chinese Medicine, head of TCM Internal Medicine Teaching & Research Dept of Zhejiang Chinese Medical University. Dr. Chen Yi has devoted himself in clinical Chinese medicine for 50 years, treated over 700,000 patients. He is proficient in classic Chinese medicine, had accumulated abundant clinical experience, especially in treating internal difficult and complicate cases, gastro-intestinal disease, CHD, hypertension, diabetics, Bi Syndrome, liver & gall ballades disorders, lung & bronchial diseases, refractory insomnia etc, it has been achieved marvelous effectiveness. He is also skilled in health regulation for post-chemotherapy, post radial therapy, has profound attainments in health preservation & disease prevention, and health restoration by winter paste. Dr. Chen has been in dominating and participating in 15 clinical research projects from national, provincial and other different ministries, over 50 literatures have been published in national and provincial Chinese medical journals, edited 10 works. Meanwhile, he is also an excellent tutor, had cultivated and instructed hundreds of academic successors personally. Dr. Xia Yongliang is an Associate Chief Physician of Chinese Medicine, Doctor of Medical Science, standing committee member and secretary of Internal Medicine Branch of Zhejiang Association of Chinese Medicine, committee member of Geriatrics Branch of Zhejiang Association of Chinese Medicine, and committee member of Emotional Disease Branch of Zhejiang Association of Chinese Medicine. 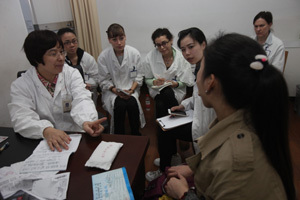 Dr. Xia has been working on clinical internal medicine and clinical teaching for couple of decades, has profound theoretical basis and rich clinical experience. Based on the experience inherited from his family and the experience learned from other famous TCM experts, he establishes his own unique techniques in syndrome differentiation, treatments for fever, cough, asthma, gastritis, insomnia, headache, vertigo, migraine, night sweat, coronary heart disease, as well as cholecystitis, constipation, cervical spondylosis, pain in waist and lower extremities, irregular menstruation, dysmenorrhea, menopausal syndrome, acne, chloasma, urticaria etc, and also using paste prescription for regulating physical constitution and health preservation. Dr. Xia is in charging and participating over 10 research projects, and also publishing more than 40 academic papers, well know in Zhejiang Province for his famous treatments and outstanding medical achievement. Dr. Jin Tao, Chief Physician of Chinese Medicine, Master of Medical Science, Master's Supervisor, and Associate Professor, is skilled in treating many kinds of internal diseases by Chinese herbal medicine, especially in treating metabolic disorder caused diseases, such as hypertension, diabetes, hyper-lipidaemia, fatty liver, chronic digestive diseases, chronic pancreatitis, and also other diseases like respiratory and cardiovascular diseases; insomnia, anxiety, depression; allergic urticaria, allergic rhinitis, allergic cough, Sjogren syndrome, Raynaud's syndrome, tumor prevention and rehabilitation. 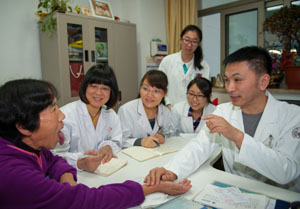 Based on the theories of different notable schools of TCM, and combined with latest achievements of modern evidence-based medicine and researches, Dr. Jin established his unique and effective TCM treatment program. He also had formulated several treatment protocols for difficult?miscellaneous?diseases, such as cardiovascular disease, insomnia, anxiety, depression, metabolic syndrome (obesity, hyperlipidaemia, hypertension, diabetes), immune system disease and allergic disease, Sjogren syndrome, asthma, autoimmune hepatitis, chronic urticaria, allergic rhinitis, chronic nephritis, stroke sequelae, myocarditis sequelae, and tumor prevention and rehabilitation. He is in charging and participating numbers of provincial tasks, and published dozens of medical academic papers on national journal. Dr. Jin is an associate professor of Zhejiang Chinese Medical University. And he has rich experiences in teaching for domestic master students and foreign TCM students from United States, Australia, Singapore, Japan, Korea, Israel, and students come from Hong Kong, Macao and Taiwan. Dr. Long Huizhen, Associate Chief Physician of Chinese Medicine, Associate Professor, professional committee member of Internal Medicine Branch of Zhejiang Association of Chinese Medicine, professional committee member of Spleen Gastric Disease Branch of Zhejiang Association of Chinese Medicine, Chinese Medicine Committee Member of Teaching Guiding Committee of Undergraduate of Zhejiang Chinese Medical University. Dr. Long has engaged in clinical internal medicine and clinical teaching over thirty years, had gained rich clinical and teaching experience. She is skilled in treating internal common and difficult diseases, especially in spleen gastric disease, chronic cholecystitis, cholelithiasis, cough, insomnia, recurrent oral ulceration, migraine, vertigo, coronary heart disease, and cervical spondylosis, pain in waist and lower extremities, geriatric disease, menopausal syndrome, chloasma, cancer etc. Dr. Long is also good at using paste prescription in regulating physical constitution and chronic diseases, enjoys high reputation for her excellent effectiveness. She also has in charging and participating 8 research projects, and had published more than 10 academic literatures. Dr. Ge Peifen is an Associate Chief Physician of Chinese Medicine, committee member of Translation Branch of China Association of Chinese Medicine, committee member of Reproductive Medicine Council of World Federation of Chinese Medicine Societies. 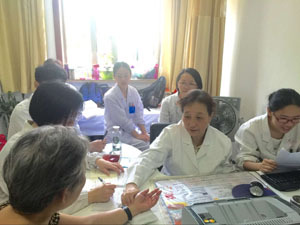 Through over 20 years' TCM clinic experience, Dr. Ge is not only skilled in chronic atrophic gastritis, chronic diarrhea, insomnia, acne, menstrual disorder, menopausal syndrome, chronic pelvic inflammatory disease, but also good at treating metabolic disorder diseases, like diabetes, gout, hyperlipidemia. She is in directing and participating 6 provincial and bureau level research subjects, one of her research achievements has awarded Second Prize of Science & Technology Dept of Zhejiang Province. She has published one monograph and 10 literatures on distinguished journals.